How do you sell the world's priciest GIF? eBay, apparently. Net artist Michael Green has taken inspiration from Jeff Koons's "Balloon Dog", the most expensive work of art sold by a living artist, to create "Balloon Dog Deflated". With a nod to the $58.4 million Koons pricetag, Green placed a Buy It Now price of $5,800 on his GIF. Unfortunately, there are only four days left on Green's eBay auction and the listing still has no bids (although it does have six watchers). 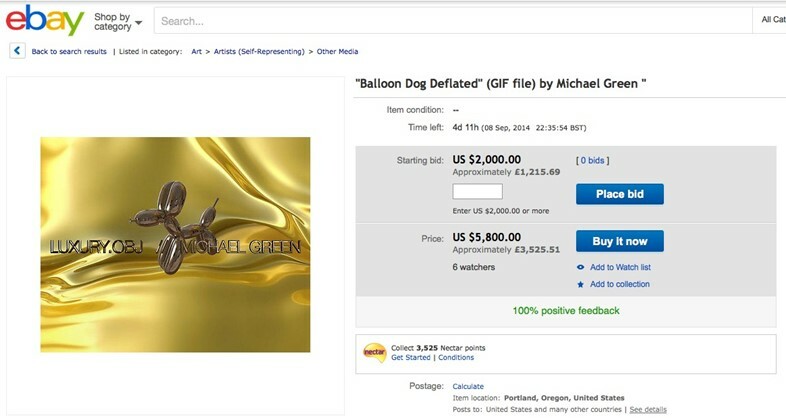 It's already the second listing for "Ballon Dog Deflated" – Green relisted the GIF when it failed to sell the first time around. While Green says the GIF is big on Tumblr, the problem is pretty obvious: I just right-clicked and saved Green's work, and it's already mine. So is the big bucks listing for "Ballon Dog Deflated" an exercise in digital optimism springing eternal, or something more? Green talked to us about trying – and maybe failing – to sell the most expensive GIF ever created. Do you really expect to sell your Koons-inspired gif for $5,800? Michael Green: Sure, why not? I did some research on unconventional eBay sellings and found somebody who needed $230 in rent so he made a drawing of a seven-legged spider, put it up on eBay and it made $10,000. Another gentlemen almost successfully sold himself, literally, for $3.5 million. $5,800 is a reasonable price because the most expensive GIF to date was sold for $1,300. Do you have anyone who you think is potentially interested? Michael Green: It is interesting because the GIF is blowing up on Tumblr but that audience doesn't have money. Then this story kind of took off on the net and I got press on a few art websites, which generated six watchers on the first auction. Now in the second auction, there are three watchers. The question is, who are these people? I would think that collectors keep in touch with these art websites. It's possible. I guess we will find out if it sells. Have you explored the idea of selling it through a gallery? Michael Green: I like the idea of it existing on eBay. When the time runs out on the auction, then it's over for the balloon dog. I don't want to be known as a GIFboy. I wanna try other things. Do think it's a problem for emerging net artists? That it’s hard to sell the work as a physical product? Michael Green: It is a problem and it is time to deal with this issue right now. As of now, in order to sell something digital, you need to have some nice packaging or presentation wrapped around it... But I don't want to play a flashy game. I'm gonna ship a generic USB that I will probably buy at Target or something. Just a GIF file. And a COA (certificate of authenticity). I propose that a website be designed that costs a lot of money to rent out, where collectors can post the works that they have purchased online and it could live on their computer for their own personal enjoyment, or for public viewing. Ideas like that could make buying a GIF more valuable. If your balloon dog was a real, physical thing that constantly deflated and magically reinflated in front you in an eternal loop, how much do you think you could sell it for? Michael Green: $58 million, no problem.